Dystopian Future? | The Solar Nerd. Recently I’ve been watching old episodes of the Twilight Zone on Netflix, as well as the more recent British series; Black Mirror. In both series future tech is weird and creepy, and in some cases truly horrific. In contrast to a bleak vision of the future I’m an optimist. The picture above captures what the future can be; clean, efficient, beautiful even. 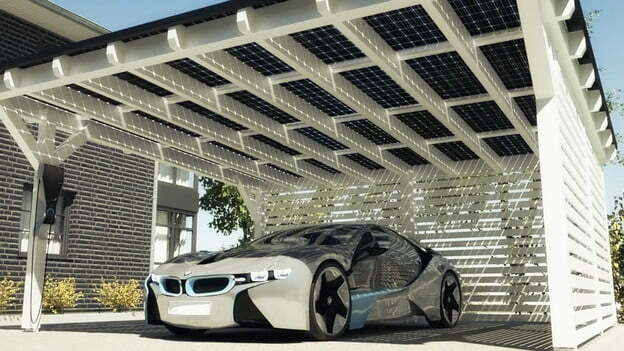 That’s the new fully electric BMW, complete with electric charger and tastefully done solar. Nice set up there. I don’t think the future is dark, but we KNOW that the past certainly was. Racism, pogroms, massive wars, systematic genocide, a filthy society when people didn’t bathe and everyone was racked with disease and lice. Just 150 years ago you were treated like an animal if you weren’t white, and even white women had no rights in society. If you were Native American, Black, Asian, etc… you were treated like dirt. If you were female AND a minority? In the past you had very few chances to really succeed, not until recently. How many black women were multi-millionaires before Oprah? A few, I’m sure… but not that many. The past was a dystopian society, and some parts of the world are still stuck in the past. The future will be more fair, more clean, more progressive. Technology makes it harder for a government to murder their own people. It still happens (Syria, for instance) but the world will know about it in minutes because of smartphone cameras and social media. Even in societies that are still mired in the past there are progressive elements that are helping people get more access to clean drinking water, birth control and education. I saw this firsthand while installing water filters in Honduras in 2012, 2013 and 2014. The future won’t be perfect, people will still act like jerks and do awful things, but technology will make them more accountable to their actions… especially when everyone has a high-res video camera in their pocket! The future is bright folks. I completely agree. Technology increases not only the widespread capabilities of accountability, but also it’s accuracy. The closer we draw to the messianic era, the brighter and brighter the ages become.